α-dystroglycan (α-DG) is an agrin-binding protein that has been implicated in acetylcholine receptor (AChR) clustering, but it is unclear whether it acts as a coreceptor involved in initial agrin signaling or as a component involved in later events. To investigate its role, we have generated antisense derivatives of the C2 mouse muscle cell line, which have reduced α-DG expression. When compared with wild-type cells, the α-DG-deficient myotubes have a dramatic reduction in the number of spontaneous and agrin-induced AChR clusters. Several findings suggest that this decrease in AChR clustering is likely not because of a defect in agrin signaling through the MuSK receptor tyrosine kinase. Compared with wild-type cells, the α-DG-deficient cell lines showed only a transient reduction in the level of agrin-induced MuSK tyrosine phosphorylation and no reduction in AChR β-subunit tyrosine phosphorylation. Additionally, agrin-induced phosphorylation of MuSK in wild-type myotubes was not decreased using agrin fragments that lack the domain primarily responsible for binding to α-DG. Finally, neural agrin-induced phosphorylation of MuSK was unaffected by treatments such as excess muscle agrin or anti-α-DG antibodies, both of which block agrin–α-DG binding. Together, these results suggest that α-DG is not required for agrin-MuSK signaling but rather that it may play a role elsewhere in the clustering pathway, such as in the downstream consolidation or maintenance of AChR clusters. The development of the neuromuscular synapse occurs via the interplay of signals between the innervating motor nerve and the muscle cells that leads to a progressive, localized specialization of the pre- and postsynaptic cells (Hall and Sanes, 1993). A motoneuron-derived factor called agrin plays a key organizing role in this process and is required for the induction of many aspects of both pre- and postsynaptic differentiation (for review, seeBowe and Fallon, 1995; Kleiman and Reichardt, 1996). In particular, neural agrin induces the postsynaptic clustering of the acetylcholine receptor (Gautam et al., 1996), as well as the accumulation at these clusters of other synaptic proteins such as rapsyn, dystroglycan, and utrophin (Wallace, 1989; Campanelli et al., 1994; Gee et al., 1994;Bowe and Fallon, 1995). 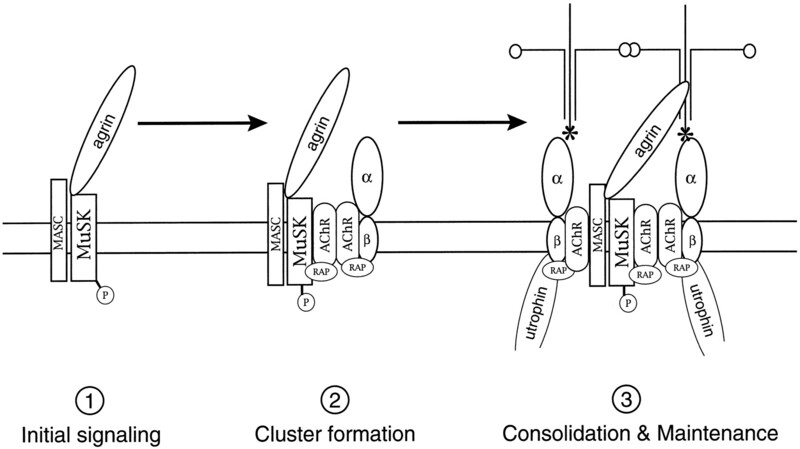 Neural agrin seems to act via a receptor tyrosine kinase, MuSK, that is localized to the end-plate regions of skeletal muscle (Valenzuela et al., 1995). Neural agrin induces a rapid tyrosine phosphorylation of that receptor (Glass et al., 1996), and in MuSK-deficient mice, there is a complete absence of postsynaptic differentiation, including clustering of acetylcholine receptor (AChR) beneath the nerve terminal (DeChiara et al., 1996). Agrin also binds with relatively high affinity to α-dystroglycan (α-DG) (Bowe et al., 1994; Campanelli et al., 1994; Gee et al., 1994; Sugiyama et al., 1994), a cell surface glycoprotein that is part of a transmembrane complex of dystrophin-associated proteins (for review, see Carbonetto and Lindenbaum, 1995). α/β-DG is concentrated at AChR clusters in vivo and in vitro, and antibodies to α-DG can disrupt agrin-induced AChR clustering (Campanelli et al., 1994; Gee et al., 1994; but see Sugiyama et al., 1994). In addition, a minimal agrin fragment that lacks the α-DG-binding domain (Hopf and Hoch, 1996) is significantly less active in inducing AChR clustering and phosphorylation than are larger fragments that do bind α-DG (Gesemann et al., 1995, 1996; Meier et al., 1996). These findings implicate α-DG in agrin-induced AChR clustering; however the precise function of α-DG is currently unclear. α-DG could act as a coreceptor involved in presenting agrin to the receptor tyrosine kinase MuSK. Consistent with this idea, it has been proposed that a coreceptor is required for agrin-MuSK signaling because agrin does not bind or activate MuSK expressed in fibroblasts or myoblasts (Glass et al., 1996). Alternatively, α-DG may act downstream of agrin-receptor signaling by contributing to the growth and/or maintenance of AChR aggregates, or it may merely have a structural role in stabilizing the neuromuscular junction via interactions with the basal lamina. To elucidate the role of α-DG in agrin-induced AChR clustering, we have generated antisense derivatives of the C2 mouse muscle cell line that have reduced α-DG. 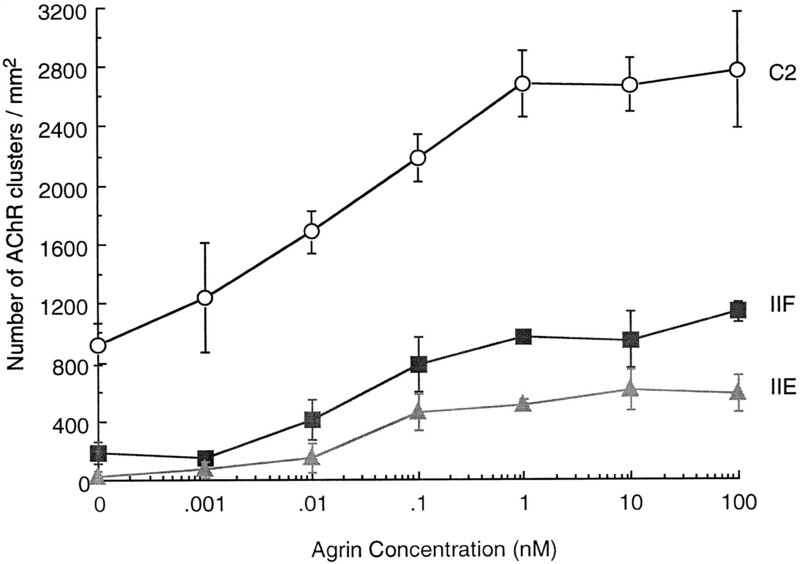 These lines show a dramatic reduction in the number of spontaneous and agrin-induced AChR clusters but little or no change in agrin-induced MuSK and AChR β-subunit phosphorylation. Additionally, the activation of MuSK by agrin in wild-type C2 myotubes was not inhibited by treatments that block agrin–α-DG binding or decreased using agrin fragments that do not bind α-DG. Together, these results suggest that α-DG is not required for agrin-MuSK signaling but that it may play a role in the subsequent formation of AChR clusters. Generation of α-DG antisense lines. An 1800 bp fragment of the mouse dystroglycan cDNA, extending from approximately −100 bp (5′ to the translational start site) to the HindIII site situated at +1725 bp, was removed by digestion of a mouse dystroglycan cDNA subclone in bluescript SK(−) (M. Lindenbaum and S. Carbonetto, unpublished observations) withNotI/HindIII. ThisNotI/HindIII cDNA fragment was then subcloned in the antisense orientation into theNotI/HindIII-digested expression vector pRC cytomegalovirus (Invitrogen, San Diego, CA) using standard subcloning techniques. Before transfection, the plasmid was linearized by digestion with BglII. Stable transfections were performed on C2 myoblasts by the method of calcium phosphate coprecipitation. Briefly, C2 myoblasts plated on 10-cm dishes were incubated with fresh media for 3 hr, and the DNA/CaPO4 coprecipitate was prepared using 5 μg of linearized plasmid per plate. The coprecipitate was added to culture medium, and the cells were incubated for 16 hr. After incubation, the medium and precipitate were removed by aspiration, the cells were washed briefly with DPBS + 0.5 mm EDTA to remove excess bound precipitate, and fresh medium was added. Twenty-four to thirty-six hours after the start of transfection, the medium was replaced with selection medium consisting of growth medium supplemented with 750 μg/ml G418 (active concentration; Life Technologies, Gaithersburg, MD). Selection was performed for up to 10 d or until all the cells on an untransfected control plate were killed. At that point, drug-resistant C2 cell colonies could easily be seen on transfected plates. Colonies were then picked and expanded for further characterization. Once expanded, stable clones were maintained in 100 μg/ml G418. Culture of muscle cell lines. Mouse C2 muscle cells were cultured as described previously (Ferns et al., 1992). Briefly, myoblasts were plated onto 100-mm tissue culture dishes and fed daily with DMEM with high glucose (DMEM-HI) supplemented with 20% fetal bovine serum, 5% chick embryo extract, and 100 U/ml penicillin–streptomycin (Life Technologies). After reaching confluence, cells were switched to fusion media (DMEM-HI supplemented with 1–5% horse serum and 100 μg/ml l-glutamine) and allowed to differentiate into myotubes for 3–4 d. For experiments involving the α-DG antisense lines, all cells (C2, IIF, and IIE) were cultured in dishes coated with 0.1% gelatin. Quantification of AChR clusters. For analysis of spontaneous and agrin-induced clusters, wild-type C2 or α-DG antisense lines were grown within two compartments drawn with a wax pencil in Falcon 10-mm tissue culture dishes. After 3 d of differentiation in fusion media, myotube cultures were treated with recombinant agrin (C-Ag 4,8) at a range of concentrations for 16 hr, and the cultures were then fixed in 2% paraformaldehyde in PBS for 15 min. To visualize the AChR, we then incubated the myotubes in the compartments with rhodamine-conjugated α-bungarotoxin (1 μg/ml; Molecular Probes, Eugene OR) for 20 min and coverslipped and viewed the myotubes with a Zeiss fluorescence microscope at a final magnification of 400×. The number of AChR clusters above 2.5 μm in diameter and the area of myotube segments (Gee et al., 1994) were determined for 10–30 random fields for each compartment. The number of AChR clusters was expressed per myotube area to take into account any difference in cell density between the cultures. Statistical significance of differences in the responsiveness of C2, IIF, and IIE cells to agrin treatment was determined with an ANOVA and Fisher’s test (using StatView). Agrin fragments and treatment. The C-Ag constructs used in these experiments have been described previously (Ferns et al., 1993), and a truncated −G1 or N4 4,19 construct was generously provided by Werner Hoch (Hoch et al., 1994). The 4,8 and 0,8 isoforms of the N4 fragment were generated by digesting the plasmid withKpnI and ligating in the corresponding fragment from C-Ag 4,8 or 0,8. The agrin fragments were expressed by transient transfection of COS cells as described previously, and the concentration of the fragments in the conditioned media was determined by comparison with a standard of purified agrin on immunoblots (Ferns et al., 1993). For experiments assessing MuSK or AChR β-subunit tyrosine phosphorylation, agrin fragments were typically added to myotube cultures at 100 pm to 1 nm for 15–30 min. In competition experiments, neural agrin was added at 50 pmand muscle agrin at 5 nm. Anti-α-dystroglycan antibody IIH6 was added at concentrations equivalent to those cited inGee et al. (1994). Extraction and isolation of MuSK and AChR. In assays for MuSK or AChR phosphorylation, myotube cultures were treated with agrin, rinsed, scraped off in Ca- and Mg-free PBS containing 1 mmsodium vanadate, and pelleted. Cell pellets were then extracted with buffer containing 1% Triton X-100 and 25 mm Tris-glycine, pH 7.5, 150 mm NaCl, 5 mm EDTA, 1 mm sodium vanadate, 50 mm sodium fluoride, and the protease inhibitors 1 mm aprotinin, 1 mmleupeptin, 1 mm pepstatin A, 1 mmbisbenzamidine, 1 mm iodoacetamide, and 1 mmPMSF. After incubation on ice, the insoluble material was removed by centrifugation at 16,000 × g for 5 min at 4°C. The supernatant was retained, and the protein concentration of the extracts was determined. To immunoprecipitate MuSK, we incubated the extracts at 4°C with an anti-MuSK peptide antibody for 1–2 hr and then with Protein G beads for an additional 1 hr. The beads were pelleted and washed four times in a 50 mm Tris buffer containing 0.5 m NaCl. The proteins isolated on the beads were then eluted directly in 30 μl of SDS-PAGE sample buffer. To isolate the AChR, we incubated the extracts with α-bungarotoxin-conjugated beads for 1–2 hr and washed and eluted as above. Alternatively, to isolate selectively surface AChR, we added biotinylated α-bungarotoxin (Molecular Probes) to myotube cultures 1 hr before harvesting. Cells were then extracted as above and incubated with 100 μl of streptavidin-conjugated sepharose beads (Molecular Probes) for 2 hr. Western blot analysis. Samples were electrophoretically separated on 8% SDS-PAGE gels and transferred onto nitrocellulose membranes. For phosphotyrosine blots, the proteins were probed with a monoclonal anti-phosphotyrosine antibody (mAb 4G10; Upstate Biotechnology, Lake Placid, NY) in buffer containing 5% BSA, 10 mm Tris-HCl, pH 7.4, 0.15 m NaCl, 0.5% NP40, and 0.1% Tween-20. The blots were then incubated with a horseradish peroxidase-conjugated anti-mouse Ig secondary antibody (Amersham, Arlington Heights IL) and bound antibody was visualized by chemiluminescence (ECL; Amersham). To probe for α-DG, we incubated the blots with mAb IIH6 in buffer with 5% dry milk and detected α-DG with an HRP-conjugated goat anti-mouse IgG–IgM secondary antibody. The immunoblots were reprobed for the AChR β-subunit with monoclonal antibody 124 or for MuSK with an anti-MuSK polyclonal antibody. To quantify levels of tyrosine phosphorylation, we performed densitometric analysis of the relevant bands using Sci-Scan 5000 Bioanalysis software (United States Biochemicals, Cleveland, OH). To average several independent experiments, we expressed all values as a percentage of that for agrin-treated C2 cells at 60 min. We confirmed the accuracy of this analysis by running a dilution series of tyrosine-phosphorylated MuSK in which we found that the measured densities closely matched the expected values. In addition, we always performed the analysis on films with subsaturating exposure levels. Antibodies. An anti-MuSK antisera was generated by injecting a 20 amino acid peptide corresponding to the C terminal of MuSK into each of two rabbits. After several boosts, the resulting antisera were tested for reaction against the immunizing peptides by ELISA. The IgG fraction was purified from the antisera of highest titer, and this antibody was found specifically to immunoprecipitate MuSK from C2 myotube extracts, as the immunoprecipitation could be competed by addition of excess peptide. The mAb 124 specific to the β-subunit of the AChR was generously provided by Dr. J. Lindstrom (University of Pennsylvania), and the anti-α-dystroglycan antibody IIH6 was generously provided by Dr. K. Campbell (University of Iowa). We have tested whether α-DG is required for agrin-induced clustering by generating variants of the C2 mouse muscle cell line that express reduced levels of α-DG. Myoblasts were stably transfected with an antisense construct for α-DG and a neomycin-resistance gene, and clones were selected for G418 resistance. Myotube cultures of each of the lines were then assayed for α-DG protein levels, and the results are shown in Figure 1,A and B. The immunoblots shown were probed with anti-α-DG antibody IIH6, but identical results were obtained with a polyclonal antibody to the core protein (M. Lindenbaum, F. Montanaro, and S. Carbonetto, unpublished observations). We found two lines that had significantly reduced levels of α-DG protein compared with that in wild-type C2 cells; these lines are IIF and IIE, which have ∼40 and 10% of the C2 level, respectively (Fig.1A). Some other lines, such as 9B, 10C, and 11A, had levels of α-DG similar to that of wild-type C2 myotubes (Fig. 1B) and were used as controls. Further characterization of the cell lines indicated that the decrease in α-DG was specific, because several other proteins were still expressed at levels equivalent to those seen in the wild-type C2 myotubes, including the MuSK receptor tyrosine kinase (Fig.1A) and α-sarcoglycan (Lindenbaum, Montanaro, and Carbonetto, unpublished observations). In addition, we found that surface levels of AChR were similar in all the lines (Fig.1A,B) and that all lines formed extensive myotubes, suggesting that the α-DG antisense lines reached a similar level of differentiation to that of wild-type C2 myotubes. In a separate study, we show that the decreased levels of α-DG in these lines reduce the amount of cell surface-associated laminin (Lindenbaum, Montanaro, and Carbonetto, unpublished observations). Acetylcholine receptor clustering in α-DG antisense cell lines. A, B, α-Dystroglycan antisense cell lines were assayed for the expression of α-DG, AChR β-subunit, and MuSK. Immunoblots for α-DG with antibody IIH6 indicate that two antisense lines (IIF andIIE) have a dramatic reduction in α-DG levels compared with that in wild-type C2 cells. Immunoblots of MuSK and of AChR β-subunit show that their levels are equivalent in all cell lines assayed. Because the AChR was isolated after the labeling of live cells with biotinylated α-bungarotoxin, the amount of β-subunit reflects surface levels of AChR. C, Agrin-induced AChR clustering was compared in wild-type and α-DG antisense cell lines by treating myotubes overnight with 1 nm neural agrin (C-Ag 4,8). AChR clusters visualized with rhodamine α-bungarotoxin were counted for each line and are expressed as a percentage of the C2 level. The number of AChR clusters was decreased in the antisense lines with reduced α-DG (IIF and IIE) but was unaffected in the lines with near normal α-DG levels (9B,10C, and 11A). Black barsrepresent spontaneous clusters; gray bars are agrin-treated. Values shown represent the average of two to three experiments. To test whether α-DG is required for agrin-induced AChR clustering, we initially treated the different muscle cell lines with neural agrin at saturating concentrations (C-Ag 4,8 at 1 nm for 16 hr) (Ferns et al., 1996) and assayed AChR cluster numbers. We found that the two lines that have reduced levels of α-DG (IIF and IIE) also have significantly fewer agrin-induced AChR clusters compared with that in wild-type C2 cells (Fig. 1C). In contrast, muscle lines expressing near wild-type levels of α-DG (9B, 10C, and 11A) showed normal levels of AChR clustering. The level of agrin-induced receptor clustering also appeared to correlate with the remaining level of α-DG in the two lines and did not correspond to AChR levels that were approximately equivalent in all lines. Thus, these findings suggest that α-DG is required for some phase of agrin-induced AChR clustering. To define further the role of α-DG, we compared levels of AChR clustering in the IIF, IIE, and wild-type C2 lines in relation to agrin concentration. We found that the α-DG antisense lines have a reduced ability to form both spontaneous and agrin-induced AChR clusters compared with wild-type C2 myotubes. In control cultures (not treated with agrin), C2 myotubes had an average of 923 spontaneous AChR clusters/mm2, whereas IIE and IIF myotubes had only 187 and 34 clusters, respectively (p < 0.0001, ANOVA and Fisher’s test). Similarly, we found that the number of agrin-induced clusters is decreased in both IIF and IIE cells relative to that in C2 cells at all agrin concentrations tested (Fig.2). In particular, when agrin is applied in saturating concentrations (≥1 nm), the peak cluster number is 2708, 1018, and 566 per mm2 for C2, IIF, and IIE cells, respectively. After correcting for the differing levels of spontaneous clusters, we find that IIF and IIE cells form only 46 and 30% of the wild-type number of clusters, respectively (p < 0.0001) (Fig. 2). The ability of the antisense cells to cluster AChRs is thus approximately proportional to their expression level of α-DG, that is, 40% for IIF and 10% for IIE cells. Agrin-induced AChR clustering is decreased in cell lines with reduced α-DG. The level of AChR clustering was determined for C2, IIF, and IIE myotubes after overnight incubation with neural agrin, at concentrations ranging from 1 pm to 100 nm. The IIF and IIE myotubes with reduced α-DG show a significant decrease in the number of spontaneous and agrin-induced AChR clusters per myotube mm2 compared with that in wild-type C2 cells (p < 0.05 at all concentrations of agrin, by ANOVA and Fisher’s test). All three muscle lines respond to agrin at similar concentrations; however the IIF and IIE cells form 2.7- and 4.8-fold fewer AChR clusters, respectively, at saturating agrin concentrations than do wild-type cells. Each value represents the mean ± SD for two to five experiments. Although spontaneous and peak cluster numbers differ between the three lines, the agrin dose–response curves for IIE and IIF are not shifted toward significantly higher effective concentrations relative to that for wild-type C2 myotubes (Fig. 2). Indeed, the agrin concentration required to induce half-maximal AChR clustering in each line is 20 pm for C2 and 30 pm for the IIF and IIE muscle lines. The α-DG antisense lines therefore respond to agrin at approximately equivalent concentrations to that of wild-type C2 cells but form fewer clusters. In addition, we find in preliminary experiments that these remaining clusters are the same size as those in wild-type C2 myotubes and that they have α-DG associated with them. Together, these results suggest that α-DG is required for agrin-induced AChR clustering but that it may not act in the initial, signaling phase of the pathway. In the following experiments, we test further whether this is the case. Agrin has been shown to induce AChR clustering by signaling through the MuSK receptor tyrosine kinase (DeChiara et al., 1996; Glass et al., 1996) and triggers a variety of intracellular events including tyrosine phosphorylation of the AChR β-subunit (Wallace et al., 1991;Meier et al., 1995; Ferns et al., 1996). To test more directly whether α-DG might be involved in agrin signaling, we compared agrin-induced MuSK and AChR phosphorylation in C2 and the α-DG-deficient lines. The C2 and IIE myotube cultures were treated with equal concentrations of recombinant neural agrin (C-Ag 4,8; 1 nm) (Ferns et al., 1993), and immunoprecipitates of MuSK or AChR were electrophoresed and immunoblotted with an anti-phosphotyrosine antibody (mAb 4G10) (Fig.3). Reprobes of the immunoblots with antibodies to MuSK or to AChR subunits showed that equal levels of each were present in the C2 and IIE samples (data not shown). 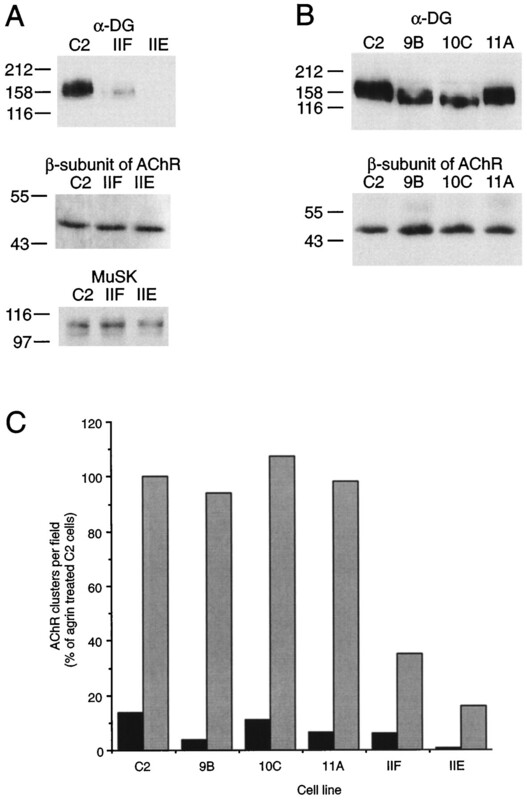 A quantitative comparison of the levels of MuSK and AChR β-subunit phosphorylation in C2 and IIE myotubes is shown in Figure4 (n = 3–7). For these experiments, densitometric analysis was always performed on exposures that were within the linear range of the film (see Materials and Methods). Comparing wild-type and IIE myotubes treated with agrin for 15 min to 3 hr, we find that on average the level of agrin-induced phosphorylation of MuSK was comparable, with a reduction being evident in IIE myotubes only at 15 min (p < 0.01, Student’s t test; n = 7) (Figs.3A, 4A). Thereafter, there was a trend toward lower levels of MuSK phosphorylation in IIE cells, but these differences were not statistically significant. Moreover, levels of MuSK phosphorylation were not decreased in the IIF cell line at any time point (data not shown). In all cell lines, agrin-induced phosphorylation of MuSK began to decline after 1 hr and was only one-third of the peak level by 3 hr (Figs. 3A,4A). A similar, transient decrease in the level of MuSK phosphorylation in IIE cells compared with that in wild-type C2 was also found using a lower agrin concentration of 200 pm(data not shown). Agrin signaling is not significantly inhibited in muscle lines with decreased α-DG. 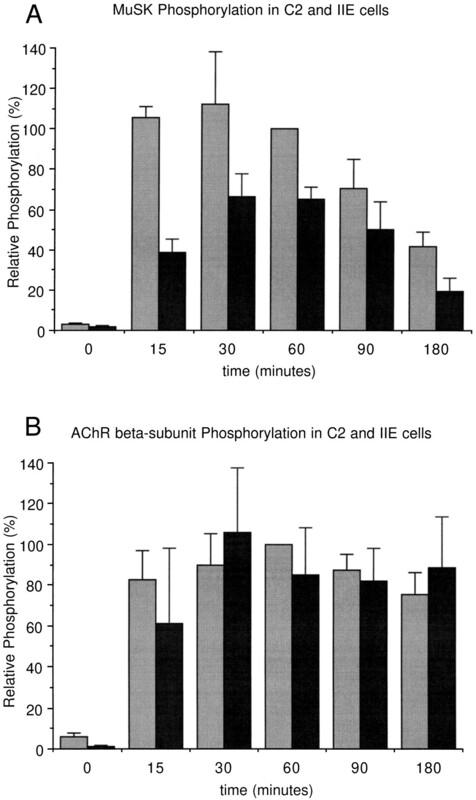 Representative immunoblots comparing agrin-induced tyrosine phosphorylation of MuSK and the AChR in C2 and IIE myotubes after incubation with 1 nm agrin for the indicated times are shown. MuSK and the AChR were isolated from cell extracts by immunoprecipitation and then immunoblotted with the anti-phosphotyrosine antibody 4G10. A, The level of agrin-induced tyrosine phosphorylation of MuSK is similar in C2 and IIE myotubes. B, Agrin-induced tyrosine phosphorylation of the AChR β-subunit is also equivalent in C2 and IIE cells. Reprobes of these immunoblots with either anti-MuSK or anti-β-subunit antibodies indicated that equal amounts of each protein were present in all samples from the two lines (data not shown). Molecular mass markers (kDa) are indicated on both the left andright. 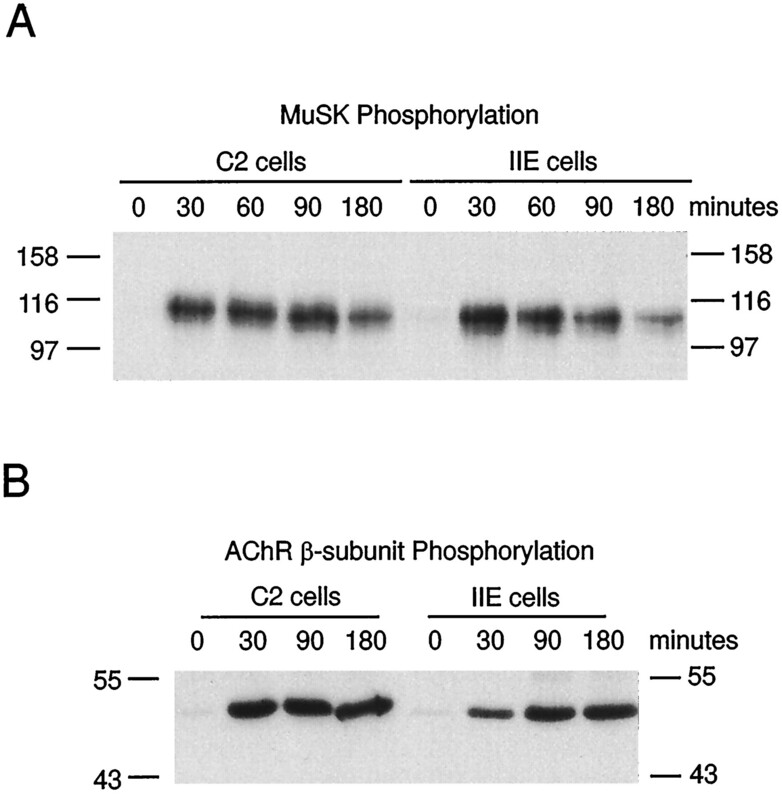 Quantitative comparison of MuSK and AChR β-subunit phosphorylation in C2 and IIE myotubes. A, Agrin-induced phosphorylation of MuSK was quantified by densitometric analysis of immunoblots and is shown averaged for five experiments. The level of MuSK phosphorylation is decreased in IIE compared with C2 myotubes by ∼60% at 15 min (p < 0.01, paired Student’s t test). At longer time points, slight differences are apparent, but they are not statistically significant.B, Levels of AChR β-subunit tyrosine phosphorylation are shown averaged for three experiments. No difference in agrin-induced phosphorylation of the β-subunit is evident between C2 and IIE myotubes at any time point. Results represent the mean ± SEM. C2 cells are represented by shaded bars, and IIE cells are represented by black bars. When we compared agrin-induced tyrosine phosphorylation of the AChR β-subunit, no significant difference was noted between C2 and IIE myotubes at any time point (Figs. 3B, 4B;n = 3). Thus, the transiently decreased level of MuSK phosphorylation in IIE myotubes compared with that in C2 myotubes was not reflected in the level of AChR tyrosine phosphorylation (Figs.3B, 4B). Together, these findings show that although there is a transient reduction in agrin-induced MuSK phosphorylation in the IIE α-DG-deficient myotubes, this does not significantly affect downstream signaling events like phosphorylation of the AChR. It seems unlikely, therefore, that the approximately threefold decrease in the level of AChR clusters in IIE myotubes compared with that in wild-type myotubes is caused by a defect in initial agrin signaling. To investigate the possible role of α-DG further, we tested whether agrin–α-DG binding is required for agrin signaling in wild-type C2 myotubes. Agrin has been shown previously to bind to α-DG through defined domains in the C terminal of agrin (Gesemann et al., 1996; Hopf and Hoch, 1996). We therefore tested whether α-DG acts as a coreceptor by deleting the primary α-DG-binding domains from agrin and then by assaying the ability of these agrin fragments to induce tyrosine phosphorylation of the MuSK receptor. We first compared agrin fragments that either contained or lacked the G1 domain that is primarily responsible for binding to α-DG (Fig.5A) (Hopf and Hoch, 1996). Neural agrin fragments that contained the G1 domain (C-Ag + G1 4,8 or 0,8) induced a rapid and dramatic increase in MuSK tyrosine phosphorylation (Fig. 5B). These agrin forms were active in inducing MuSK phosphorylation at concentrations of ∼50 pmor greater. When we then examined agrin forms in which the G1 domain had been deleted (−G1 4,8 or 0,8), we found that they were similarly active in inducing MuSK phosphorylation. On average (n= 4), there was no quantitative difference in the concentrations at which agrin forms plus and minus the first G1 domain were active. We conclude that the deletion of the G1 domain has no effect on the ability of agrin to induce MuSK phosphorylation (Fig. 5B), and an agrin–α-dystroglycan interaction via this domain is unlikely to be necessary in agrin signaling. Agrin-induced phosphorylation of MuSK correlates with heparin but not α-DG binding. A, Schematic depicting the agrin constructs used to test whether agrin-induced phosphorylation of MuSK is dependent on the first G domain that binds α-DG with high affinity (horizontal solid line) or on the 4 amino acid-splicing insert that confers binding to heparin (horizontal solid line). The region responsible for clustering activity (horizontal solid line) and its dependence on the splicing inserts at sites x, y, and z are also shown. Dashed lines denote regions that make minor contributions to α-DG binding or to AChR clustering activity. Neural agrin forms contain the 4 and 8 amino acid inserts (denoted 4,8), whereas muscle agrin forms lack both these inserts (0,0). The domains of agrin are represented as follows:ST, serine/threonine-rich domain; E1–E4, EGF-like domains; and G1–G3, laminin globular domains.B, Phosphotyrosine immunoblot of MuSK isolated from C2 myotubes that were incubated with the indicated agrin construct for 15 min at 1 nm. The presence or absence of the first G1 domain has no effect on the ability of agrin to induce MuSK phosphorylation (compare the +G1 and −G1 lanes for each isoform). In contrast, the 4 amino acid insert does affect the level of MuSK phosphorylation (compare the 4,8 vs 0,8 lanes) but is not absolutely required. The letter c indicates the control with no agrin treatment, and 0,0 represents the muscle isoform. Molecular mass markers are indicated to theleft. We also compared the activity of splice variants of agrin that contain or lack a 4 amino acid (aa) insert (Fig. 5A) that has been shown to confer agrin binding to heparin (Campanelli et al., 1996;Gesemann et al., 1996; O’Toole et al., 1996). Potentially this heparin-binding domain could mediate an interaction with α-DG or with some other proteoglycan coreceptor. We find that agrin isoforms that contain the 4 aa insert (C-Ag 4,8) induce, on average (n = 3), a fivefold higher level of MuSK phosphorylation than do forms lacking this insert (C-Ag 0,8) (Fig.5B). Absence of the 4 aa insert also resulted in decreased activity in the truncated fragments that lack the G1 domain (−G1 4,8 compared with −G1 0,8). The presence of the 4 aa insert thus increases the ability of agrin to activate MuSK, possibly indicative of an interaction with a heparan sulfate proteoglycan in the agrin-signaling complex. Although agrin signaling does not seem to involve an interaction with α-DG via the G1 domain, agrin could interact weakly with α-DG via other binding domains. We therefore tested whether treatments that compete with neural agrin binding to α-DG might also inhibit agrin signaling. Muscle agrin has been shown to compete effectively with neural agrin binding to α-DG immobilized on nitrocellulose membranes and, in fact, has a 10-fold greater affinity for α-DG than does neural agrin (Sugiyama et al., 1994; Campanelli et al., 1996; Gesemann et al., 1996). Myotubes treated with neural agrin in the presence of a 100-fold excess of muscle agrin (C-Ag 0,0 or C-Ag 4,0 at 5 nm) showed no decrease in agrin-induced phosphorylation of MuSK (Fig. 6A). Although this excess of muscle agrin may not fully saturate all α-DG-binding sites (Bowen et al., 1996), we did not use higher amounts because muscle agrin can be active at very high concentrations (≥50 nm) (Ferns et al., 1993). The anti-α-DG antibody IIH6 also blocks neural agrin binding to α-DG immobilized on immunoblots (Gee et al., 1994; Sugiyama et al., 1994) and expressed on cells (Campanelli et al., 1994). Treatment with the IIH6 antibody failed to block agrin-induced phosphorylation of MuSK in myotubes treated with neural agrin either at 1 nm (Fig.6B) or 200 pm (data not shown). Thus, several treatments that specifically block the interaction of agrin with α-dystroglycan fail to inhibit agrin-induced phosphorylation of MuSK. Competition of agrin binding to α-DG does not inhibit MuSK phosphorylation. C2 myotube cultures were incubated with neural agrin for 15 min in the presence or absence of several reagents that block agrin binding to α-DG. Neural agrin-induced phosphorylation of MuSK was then assayed by immunoprecipitating MuSK from cell extracts and immunoblotting with anti-phosphotyrosine antibody 4G10. A, Competition with muscle agrin. C2 myotubes were incubated with no agrin (c), muscle agrin alone (0,0) or (4,0), neural agrin alone (4,8), or neural agrin in the presence of a 100-fold excess of either form of muscle agrin. Neural agrin-induced phosphorylation of MuSK was not decreased in the presence of an excess of muscle agrin (0,0) or (4,0). Pretreatment of cultures with muscle agrin for 30 min (asterisk) before neural agrin addition also failed to inhibit phosphorylation of MuSK.B, Competition with the α-DG-specific monoclonal antibody IIH6. C2 myotubes were incubated with no agrin (c), neural agrin alone (4,8), neural agrin in the presence of IIH6 ascites at the indicated dilutions, or IIH6 antibody alone. The anti-α-DG antibody did not inhibit neural agrin-induced phosphorylation of MuSK. C, Competition with heparin. C2 myotubes were treated with no agrin (c) or with the 4,8 or 0,8 agrin isoform in the presence or absence of 100 μg/ml heparin (H). Heparin inhibits MuSK phosphorylation induced by the 4,8 agrin isoform, but not the 0,8 isoform, and is therefore dependent on the presence of the 4 amino acid splice insert. Molecular mass markers are indicated to the left. Finally, heparin has also been shown to block the agrin–α-DG interaction (Campanelli et al., 1994; Gee et al., 1994; Sugiyama et al., 1994; O’Toole et al., 1996) and to block agrin-induced AChR clustering (Wallace, 1990). We find that agrin-induced phosphorylation of MuSK is blocked by soluble heparin in a dose-dependent manner. Moreover, the inhibition with heparin was only observed for agrin forms that contain the 4 aa insert (Fig. 6C). Thus, C-Ag 4,8-induced MuSK phosphorylation was significantly decreased by heparin at 100 μg/ml, but C-Ag 0,8-induced phosphorylation was unaffected. Heparin presumably inhibits agrin activity, therefore, by binding only to the G2 domain of agrin forms that contain the 4 aa insert. It is unclear whether the blocking effect of heparin is caused by competition of a heparin-like interaction with α-DG or another unidentified proteoglycan, or merely by steric hindrance of binding to MuSK. We have investigated the potential role of α-dystroglycan in the formation of AChR clusters. We find that both spontaneous and agrin-induced AChR clustering are decreased in α-DG-deficient muscle cell lines compared with that in wild-type cells. This clustering defect seems to be attributable specifically to the decrease in α-DG because levels of other proteins like MuSK and the AChR were equivalent in all the muscle lines (Fig. 1A,B) and the defects in clustering correlated with the residual level of α-DG (Figs. 1C, 2). These observations suggest that α-DG is required for AChR clustering, and as a result we have examined whether α-DG acts in agrin signaling or elsewhere in the clustering pathway. Several findings suggest that a coreceptor, denoted MASC (for myotube-associated specificity component), is necessary for the activation of the MuSK receptor tyrosine kinase by agrin (Glass et al., 1996). α-Dystroglycan is an obvious candidate for MASC, because α-DG has been shown to bind agrin (Campanelli et al., 1994) and to cocluster together with the AChR (Campanelli et al., 1994; Gee et al., 1994; Sugiyama et al., 1994; Cohen et al., 1995). Several of our findings suggest, however, that α-DG is not required for agrin-MuSK signaling. First, we found that agrin acted at equivalent concentrations in wild-type and α-DG-deficient lines, indicating that there is not a shift in the dose–response curve for agrin in the α-DG-deficient lines. Secondly, we found that agrin-MuSK signaling was not substantially inhibited in the α-DG-deficient lines compared with that in wild-type cells. Although agrin-induced phosphorylation of MuSK was slightly reduced in IIE compared with that in wild-type C2 cells (but only significantly so at 15 min), the downstream tyrosine phosphorylation of the AChR β-subunit (Glass et al., 1997) was equivalent at all time points assayed. The levels of MuSK and AChR β-subunit phosphorylation are therefore equalized well in advance of AChR clustering, which was assayed in these experiments at 18 hr. Thus, there does not seem to be a major or long-lasting defect in agrin signaling in the α-DG-deficient lines that might account for their dramatically decreased level of AChR clustering. We cannot entirely discount a signaling role for α-DG, however, because the residual α-DG in the antisense lines may be sufficient for function as a coreceptor. The findings from several, independent experiments on wild-type C2 cells provide further evidence against a signaling role for α-DG. Foremost, we find that the domain of agrin that binds α-DG is not required for agrin-MuSK signaling. When we deleted the primary α-DG-binding domain in agrin (laminin G1 domain; Hopf and Hoch, 1996), we found absolutely no effect on the ability of agrin to induce tyrosine phosphorylation of MuSK (Fig. 5). This result is consistent with previous studies that have shown that the ability of agrin fragments to induce AChR clustering is not significantly affected by the presence of the first G1 domain (Hoch et al., 1994; Gesemann et al., 1995). In addition, we found that treatments that are known to block agrin-α-dystroglycan binding also failed to inhibit agrin signaling via MuSK. For example, muscle agrin binds α-DG with 10-fold greater affinity than does neural agrin (Sugiyama et al., 1994; Gesemann et al., 1996); yet excess muscle agrin failed to inhibit neural agrin-induced phosphorylation of MuSK, consistent with earlier work showing that it does not block AChR clustering (Bowen et al., 1996). Similarly, inhibition of agrin binding to α-DG with the anti-α-DG antibody IIH6 (Campanelli et al., 1994; Gee et al., 1994; Sugiyama et al., 1994) had no effect on the activation of MuSK by agrin (Fig.6B). The reported disruption of agrin-induced AChR clustering by this anti-α-DG antibody (Campanelli et al., 1994; Gee et al., 1994) thus does not stem from a block of signaling (see below). These several independent lines of evidence argue strongly against α-DG acting as a coreceptor that is required for agrin-MuSK signaling. Although specific inhibitors of agrin–α-DG binding did not affect signaling, we did observe a block of MuSK phosphorylation using heparin. Heparin has been shown previously to inhibit nerve- and agrin-induced receptor clustering (Hirano and Kidokoro, 1989; Wallace, 1990) and to block the agrin–α-DG interaction (Campanelli et al., 1994; Gee et al., 1994; Sugiyama et al., 1994; O’Toole et al., 1996). We found that heparin effectively inhibits agrin-induced phosphorylation of MuSK, but only for agrin forms containing the 4 amino acid splice insert in the second G domain (Fig. 6C). Because this 4 aa insert has been shown to confer heparin binding (Campanelli et al., 1996; Gesemann et al., 1996; O’Toole et al., 1996), this indicates that heparin is acting by binding directly to agrin rather than to some cell surface component. It is unclear whether this reflects the block of the interaction of agrin with a proteoglycan or is merely attributable to steric hindrance of agrin binding to MuSK. We also found that agrin isoforms that contained the 4 aa insert induced a fivefold higher level of MuSK phosphorylation than did forms lacking this insert (Figs. 5B, 6C), consistent with earlier studies assaying AChR-clustering activity of different agrin isoforms (Ferns et al., 1993). These results allow the possibility that agrin binding to a proteoglycan plays a small role in agrin signaling, but one that is not absolutely required. The blocking experiments, discussed above, make it unlikely that α-DG is involved in this putative heparin-binding interaction with agrin. Moreover, there is currently some debate as to whether α-DG is in fact a proteoglycan, and some results suggest it may instead have a mucin-like structure (Smalheiser and Kim, 1995; Chiba et al., 1997). We have found that muscle lines with reduced α-DG exhibit seemingly normal signaling through the MuSK receptor and yet form significantly fewer AChR clusters than do wild-type cells, suggesting that α-DG is required at some other stage of the clustering pathway. Given that the activation of the MuSK receptor by agrin is thought to be the initial event and occurs very rapidly, it seems most likely that α-DG acts downstream in the pathway, such as in the consolidation of microclusters or in the growth and maintenance of AChR aggregates. Consistent with this notion, previous studies have shown that treatment with an anti-α-DG antibody disrupts both spontaneous and agrin-induced AChR clustering (Campanelli et al., 1994; Gee et al., 1994; Cohen et al., 1995; but see Sugiyama et al., 1994). In particular, Campanelli et al. (1994) reported that the anti-α-DG antibodies appeared to block the consolidation of microclusters into larger aggregates, suggesting that α-DG might act at a stage of clustering subsequent to initial agrin signaling. In addition, heparin has recently been shown to partially inhibit some downstream step in AChR clustering (Hopf and Hoch, 1997), and because heparin binds to the protein core of α-DG (Bowe and Fallon, 1996), it may be acting by blocking α-DG function. What kind of role might α-DG play in AChR cluster formation? One possibility is that it forms part of the scaffold that is postulated to immobilize the AChR and other synaptic proteins in the postsynaptic membrane (Froehner, 1991; Carbonetto and Lindenbaum, 1995; Apel et al., 1997). Indeed, α-DG becomes coclustered with the AChR at developing synapses (Cohen et al., 1995) by a rapsyn-dependent mechanism (Apel et al., 1995). The recruitment of α-DG to this postsynaptic scaffold might then help consolidate or stabilize developing clusters (Fig.7), as α-DG is known to interact with laminin (Ibraghimov-Beskrovnaya et al., 1992; Gee et al., 1993) and both nerve and muscle agrin (Sugiyama et al., 1994) in the synaptic basal lamina. In addition, the cytoplasmic tail of β-dystroglycan has been found to bind to dystrophin/utrophin that is selectively localized in the subsynaptic cytoskeleton (Suzuki et al., 1994). Model showing where α-DG might act in agrin-induced AChR clustering. Our findings suggest that α-DG probably does not act as a coreceptor involved in initial agrin signaling via the MuSK receptor complex (1). Rather, α-DG might function downstream of MuSK activation, in the initial formation of AChR aggregates (2) or in the consolidation and maintenance of clusters (3). Consistent with this idea, α-DG becomes coclustered with MuSK and the AChR and could be required for the further development of this postsynaptic scaffold. For example, α-DG might form part of the scaffold that immobilizes and stabilizes AChR aggregates, possibly via its links to the extracellular matrix and the cytoskeleton (3).Rap, Rapsyn; α, β, α- and β-dystroglycan; andP, tyrosine phosphorylation. A potential function of α-DG in this scaffold may be to help immobilize the AChR (Fig. 7). Consistent with this, several studies have shown that exogenous laminin can induce aggregation of α-DG (Cohen et al., 1997) and increase the number, size, and density of AChR clusters in cultured myotubes (Sugiyama et al., 1997; Montanaro et al., 1998). Laminin-induced aggregation of the AChR is not accompanied by the phosphorylation of MuSK (Sugiyama et al., 1997) and is apparently mediated by aggregation of α-DG (Montanaro et al., 1998), indicating that α-DG can play a role in AChR immobilization. Laminin alone probably does not act to initiate clustering of AChRs in vivo, however, because there is a complete absence of clusters in MuSK-deficient mice that presumably express normal levels of laminin (DeChiara et al., 1996). The laminin or agrin interaction with α-DG may instead act downstream of agrin signaling via MuSK, in the subsequent development of clusters. In summary, we find that α-DG is required for agrin-induced AChR clustering. Our results suggest that α-DG is unlikely to be a required coreceptor for agrin signaling via MuSK but rather that it may have a role downstream of MuSK activation, such as in the consolidation and maintenance of AChR clusters. This work was supported by Canadian Medical Research Council Grants MT-13237 to M.F. and MA-9000 and MA-10182 to S.C., the Canadian Network Centres of Excellence, and the Muscular Dystrophy Association of the United States. C.J. and F.M. are supported by studentships from the Canadian Neuroscience Network Centres of Excellence. We would like to thank Dr. Werner Hoch for his generous gift of the truncated-agrin fragments. C. Jacobson and F. Montanaro are equal coauthors of this manuscript. Correspondence should be addressed to Dr. M. Ferns, Montreal General Hospital, Research Institute, Rs1–133, 1650 Cedar Avenue, Montreal, Quebec, H3G 1A4 Canada. (1995) Rapsyn may function as a link between the acetylcholine receptor and the agrin-binding dystrophin-associated glycoprotein complex. Neuron 15:115–126. (1997) Rapsyn is required for MuSK signaling and recruits synaptic components to a MuSK-containing scaffold. Neuron 18:623–635. (1995) The role of agrin in synapse formation. Annu Rev Neurosci 18:443–462. (1996) α-Dystroglycan binds heparin. Soc Neurosci Abstr 22:536. (1994) Identification and purification of an agrin receptor from Torpedo postsynaptic membranes: a heteromeric complex related to the dystroglycans. Neuron 12:1173–1180. (1996) Neural agrin activates a high-affinity receptor in C2 muscle cells that is unresponsive to muscle agrin. J Neurosci 16:3791–3797. (1994) A role for dystrophin-associated glycoproteins and utrophin in agrin-induced AChR clustering. Cell 77:663–674. (1996) Alternative RNA splicing that determines agrin activity regulates binding to heparin and alpha-dystroglycan. Development 122:1663–1672. (1995) The basement membrane at the neuromuscular junction: a synaptic mediatrix. Curr Opin Neurbiol 5:596–605. (1997) Structures of sialylated O-linked oligosaccharides of bovine peripheral nerve α-dystroglycan. J Biol Chem 272:2156–2162. (1995) Distribution of α-dystroglycan during embryonic nerve-muscle synaptogenesis. J Cell Biol 129:1093–1101. (1997) Laminin-induced clustering of dystroglycan on embryonic muscle cells: comparison with agrin-induced clustering. J Cell Biol 136:1047–1058. (1992) RNA splicing regulates agrin-mediated acetylcholine receptor clustering activity on cultured myotubes. Neuron 8:1079–1086. (1993) The ability of agrin to cluster AChRs depends on alternative splicing and on cell surface proteoglycans. Neuron 11:491–502. (1996) Agrin-induced acetylcholine receptor clustering in mammalian muscle requires tyrosine phosphorylation. J Cell Biol 132:937–944. (1991) The submembrane machinery for nicotinic acetylcholine receptor clustering. J Cell Biol 114:1–7. (1993) Laminin-binding protein LBP120 from brain is closely related to the dystrophin-associated glycoprotein dystroglycan and binds with high affinity to the major heparin binding domain of laminin. J Biol Chem 268:14972–14980. (1994) Dystroglycan-a, a dystrophin-associated glycoprotein, is a functional agrin receptor. Cell 77:675–686. (1995) Acetylcholine receptor aggregating activity of agrin isoforms and mapping of the active site. J Cell Biol 128:625–636. (1996) Alternative splicing of agrin alters its binding to heparin, dystroglycan, and the putative agrin receptor. Neuron 16:755–767. (1997) Kinase domain of the muscle-specific receptor tyrosine kinase (MuSK) is sufficient for phosphorylation but not clustering of acetylcholine receptors: required role for the MuSK ectodomain? Proc Natl Acad Sci USA 94:8848–8853. (1993) Synaptic structure and development: the neuromuscular junction. Neuron 10[Suppl]:99–121. (1989) Heparin and heparan sulfate partially inhibit induction of acetylcholine receptor accumulation by nerve in Xenopus culture. J Neurosci 9:1555–1561. (1994) Structural domains of agrin required for clustering of nicotinic acetylcholine receptors. EMBO J 13:2814–2821. (1996) Agrin binding to alpha-dystroglycan. Domains of agrin necessary to induce acetylcholine receptor clustering are overlapping but not identical to the alpha-dystroglycan-binding region. J Biol Chem 271:5231–5236. (1997) Heparin inhibits acetylcholine receptor aggregation at two distinct steps in the agrin-induced pathway. Eur J Neurosci 9:1170–1177. (1996) Testing the agrin hypothesis. Cell 85:461–464. (1995) Immobilization of nicotinic acetylcholine receptors in mouse C2 myotubes by agrin-induced protein tyrosine phosphorylation. J Cell Biol 131:441–451. (1996) AChR phosphorylation and aggregation induced by an agrin fragment that lacks the binding domain for alpha-dystroglycan. EMBO J 15:2625–2631. (1998) Laminin and α-dystroglycan mediate acetylcholine receptor aggregation via a MuSK-independent pathway. J Neurosci 18:1250–1260. (1996) Alternative splicing of agrin regulates its binding to heparin alpha-dystroglycan, and the cell surface. Proc Natl Acad Sci USA 93:7369–7374. (1995) Purification of cranin, a laminin-binding membrane protein. Identity with dystroglycan and reassessment of its carbohydrate moieties. J Biol Chem 270:15425–15433. (1994) Dystroglycan binds nerve and muscle agrin. Neuron 13:1–20. (1997) Laminin-induced acetylcholine receptor clustering: an alternative pathway. J Cell Biol 139:181–191. (1994) Molecular organization at the glycoprotein-complex-binding site of dystrophin: three dystrophin-associated proteins bind directly to the carboxy-terminal portion of dystrophin. Eur J Biochem 220:283–292. (1989) Agrin-induced specializations contain cytoplasmic, membrane, and extracellular matrix-associated components of the postsynaptic apparatus. J Neurosci 9:1294–1302. (1990) Inhibition of agrin-induced acetylcholine-receptor aggregation by heparin, heparan sulfate, and other polyanions. J Neurosci 10:3576–3582. (1991) Agrin induces phosphorylation of the nicotinic acetylcholine receptor. Neuron 6:869–878.